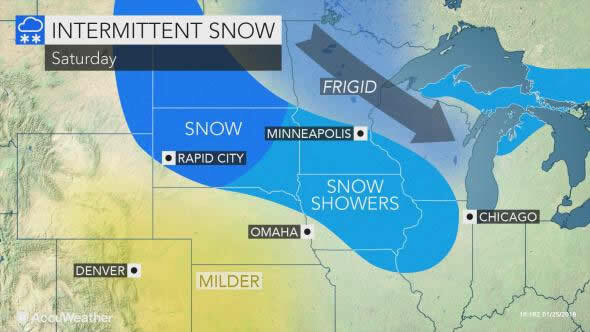 AccuWeather-(ENEWSPF)- Ahead of the harshest cold yet this season, a snowstorm will lay a swath of slick, slippery travel and disruptions to daily routines across the midwestern United States beginning on Sunday. 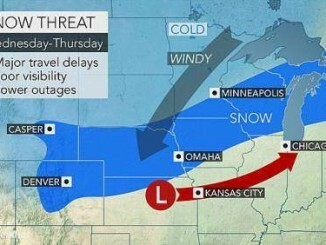 Areas of snow and slick travel can dot the region prior to the early-week storm as bitterly cold air remains in place. Highs will generally remain 10-25 degrees Fahrenheit below normal, in the single digits and teens, through the weekend. Lake-effect snow showers will continue to stream off lakes Michigan and Superior into Saturday. Patches of nuisance snow will also sweep from the northern Plains to portions of mid-Mississippi and Ohio valleys through the first half of the weekend. 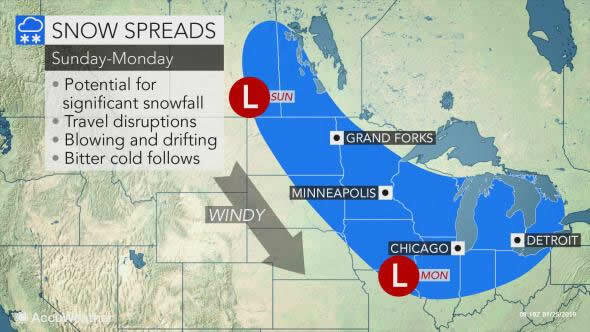 A storm with a larger and more organized swath of snow will then take a nosedive southward into the northern Plains on Sunday before reaching the lower Great Lakes on Monday. Enough snow can fall along this swath for plans and activities to be altered or canceled. Schools may be forced to use another snow day at the start of the new week, and people may have difficulties getting to work. 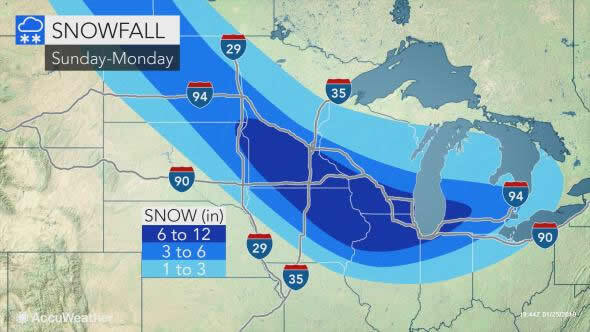 “The potential exists for the storm to drop a swath of 6 inches or more, potentially along the corridor from Fargo, North Dakota, to Minneapolis; Madison and Milwaukee, Wisconsin; Chicago and Detroit,” said AccuWeather Senior Meteorologist Kristina Pydynowski. Even if the heaviest snow falls north of Chicago and Detroit, there can still be enough snow to cause slippery travel. In fact, the storm may be just as treacherous in these cities since any areas that turn slushy can become icy as the Arctic air blasts in behind the storm. Stretches of interstates 29, 35, 75, 80, 90, 94 and 96 could be severely affected by the storm. “The snow north of the storm’s track will be powdery, which will help ease the hardships of shoveling amid the frigid conditions,” Pydynowski said. However, gusty winds whipping in with the storm can blow around the light and fluffy snow, creating blowing and drifting concerns as well as whiteouts on the roadways. Strong winds will whip through the High Plains even in the absence of snow, with gusts past 50 mph possible from eastern Montana to Nebraska and Kansas from Sunday through Monday. 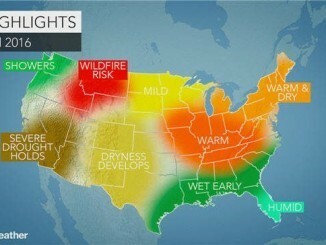 Air travel can also be severely affected in Minneapolis and Detroit. 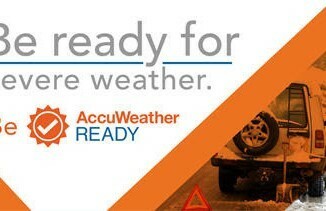 Download the AccuWeather app to see just how much snow will accumulate in your area. To the delight of ski resorts and winter sports enthusiasts, the storm will also unleash a quick-hitting shot of snow along the spine of the Rockies. Denver may be whitened by a bit of snow on Monday. Brutal cold will plunge into the nation’s midsection as the storm sweeps eastward early in the new week. The cold can catch up to the tail end of the storm quickly enough for rain to changeover to snow in portions of the Ohio and Tennessee valleys and into part of the lower Mississippi Valley and Southeast from Monday night to Tuesday. AccuWeather meteorologists are closely monitoring the potential for a few inches of snow to accumulate in part of the South early next week. 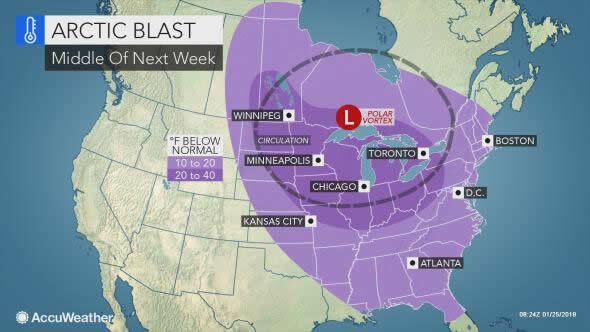 People in the Northeast should also keep a close eye on the storm, which can unleash disruptive snow in the region around Tuesday and Wednesday of next week.